These photos are of the same pickguard, different angles, same natural inside light source. Each 'Flecker' is a hand finished pattern. This method truly brings out the supreme interactive surface light reflects that stainless steel is best at. Polished gleaming 100% non-magnetic stainless steel, corrosion free. No color is added, it's polished silvery surface is naturally reflective. Light refracts from different directions like 3D, following the direction of the polished surface. This particular surface design is hand made. The guard pictured here is the exact guard you are buying. 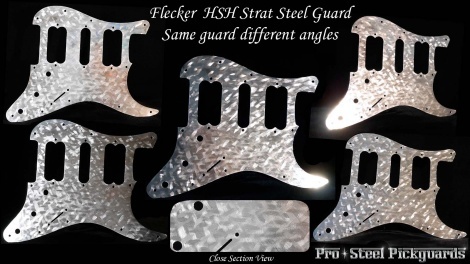 FITS - HSH Pickguard fits most genuine Fender USA & MiM HSH Strats. Or any Standard Strat SSS when neck and bridge pickups are changed for Humbuckers to HSH. - American, Mexican, Standard, Blacktop, Classic, Deluxe, Special, FSR, Power, Ehsaan Noorani, Road Worn, Lonestar, Vintage Modified, Classic Player, Modern Player. If you have previously had a problem with a regular genuine Fender Strat guard fitting your guitar, see Downloads and print the template to check fit.